OpenCdA’s November 18, 2014, post entitled Confirm Loretta E. Lynch — Soon! 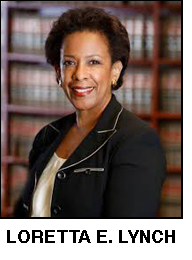 informed readers that Lynch would be required to complete a detailed questionnaire for the Senate Judiciary Committee in preparation for her confirmation hearings. We promised that when it became available, we would post Lynch’s completed questionnaire and her answers here. Here is the Senate Judiciary Committee’s 56-page questionnaire with Attorney General nominee Loretta E. Lynch Hargrove’s answers.